VpCI-309 SF is a silica-free version of VpCI-309. It is Vapor phase Corrosion Inhibitor powder for corrosion protection of ferrous metals in recessed areas, interior cavities and voids. VpCI-309 SF provides an extremely efficient dry method to protect metals within an enclosed space. The VpCI vaporizes and adsorbs on all metal surfaces reaching all exposed areas including recessed sections and interior cavities. Apply powder by dusting, fogging, or sprinkling. After application simply cover, close or seal the interior cavity or void. Fogging is easily achieved with a low pressure air hose and sandblast cup or by inverting a wet/dry vaccuum. Large conventional sandblasting systems can also be used. 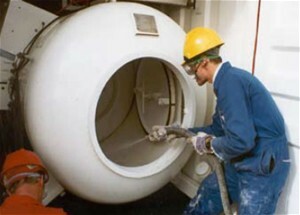 METHOD OF REMOVAL: When required, VpCI-309 SF in powder form can be removed by using a low pressure air gun or by a water rinse. Typically, if applied in aqueous form the product does not require removal.